After the Bò Nướng Vĩ/ Bò Nhúng Dấm Spring Roll Party, there were tons of extra uncooked beef, shrimp, and veggies. I don’t mind the left overs because there are so many things you can do with it for subsequent meals. Simply bring a pot water to a boil, cook the Vermicelli Noodles according to the package instructions, and quickly stir fry the extra beef and shrimp however you want it prepared. Vermicelli noodles are super versatile because it goes well with any stir fry. In this blog, you will find two quick stir fry recipes to go with the vermicelli noodles. 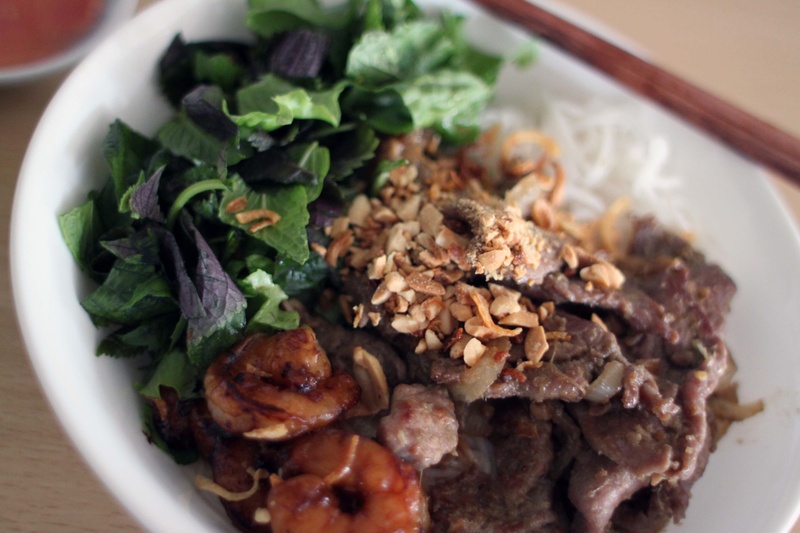 The Lemongrass Beef is spicy and full of delicious intense fish sauce flavor and the second is Honey Soy Shrimp is sweet and addicting soy sauce flavor. If you don’t have time or don’t want to do two different marinades, you can certainly marinate the beef and shrimp in the same marinade to save some time. Either way, it will come out fantastic. Lemongrass Beef Stir Fry – Marinade beef in fish sauce, oyster sauce, sugar, 2 tablespoons minced lemongrass for at least half hour. Heat skillet on medium high. When hot, add 1 tablespoon oil, saute 2 tablespoons lemongrass, thai chiles, and garlic for 30 seconds. 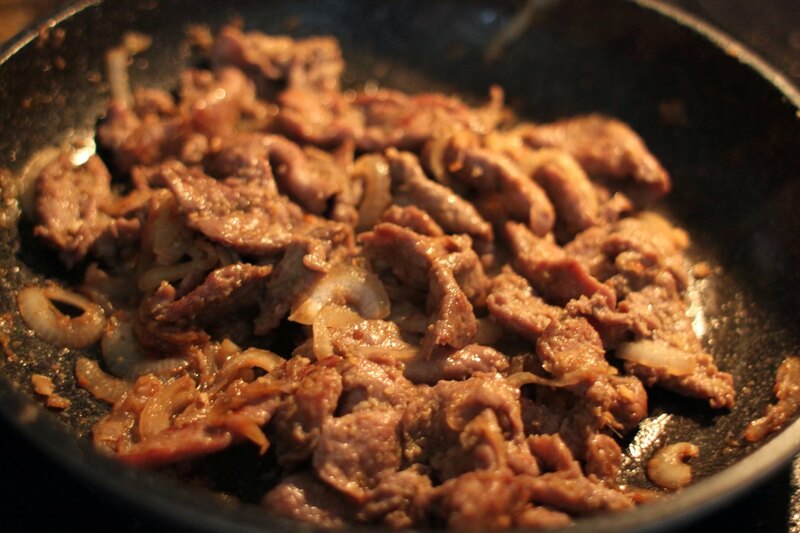 Add beef and onions and cook for 3 minutes until beef is done. Ginger Honey Soy Shrimp – Marinade shrimp in soy sauce, honey, and ginger. Heat skillet on medium high. Add 1 tablespoon oil. Fry shrimp a minute each side. Set aside. 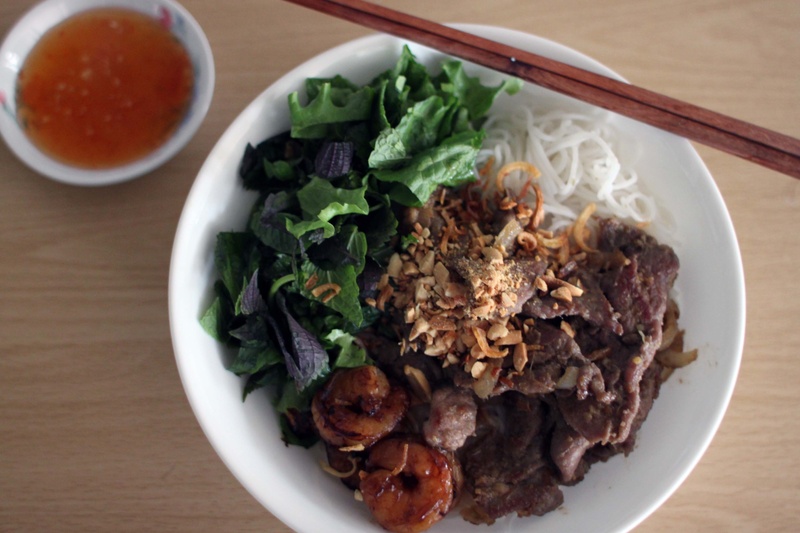 Assembling Vermicelli Bowls – Add Vermicelli, meat/shrimp, red leaf lettuce, perilla leaves, peanuts, fried shallots, and pickled carrots and daikon to a bowl. Top off with fish sauce to taste.